The Tate, which has the most substantial track record in commissioning such trees, is reprising an earlier triumph. 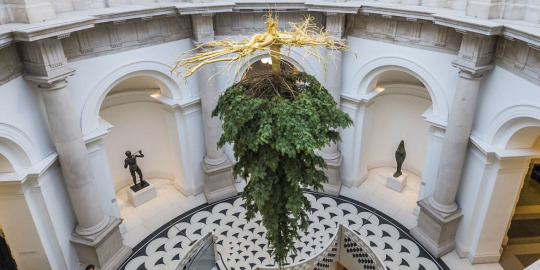 Shirazeh Houshiary’s Christmas Tree 2016 reimagines her 1993 tree at the Tate, both of which hung upside with their exposed roots covered in gold leaf. Houshiary’s tree encourages reflection on hidden aspects of life which, like the roots of the tree, are often the source of stability, nourishment, and longevity. 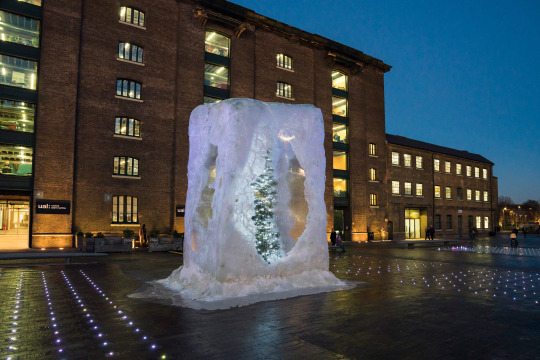 The Granary Square fountains in Kings Cross have Alex Chinneck’s Fighting Fire with Ice Cream where a 17-foot tall tree adorned with 1,200 lights is seemingly frozen in an ice cube. This installation has been carved and cast from two tonnes of resin and is the height of a two-storey house. Chinneck’s tree appears to emerge fully formed and functioning from its supposed ice encasing and yet the story of evergreen trees as a symbol of Christmas is one of a lengthy gestation. Unlike Father Christmas, where a Christian Christmas story has increasingly been secularised over the years, the use of evergreen fir trees at Christmas was essentially a later inculturation by the Church of a pagan symbol, giving Christmas Trees a broad frame of reference for artists to exploit when responding to tree commissions. The Christmas tree tradition as we know it now seems to have begun in Germany during the 16th century when Christians brought decorated trees into their homes. This tradition then became more generally fashionable in the 1840s when Queen Victoria and her German Prince, Albert, were sketched in The Illustrated London News standing with their children around a Christmas tree. AS a relatively new member of the clergy team at St Martin-in-the-Fields, I was for the first time part of the now 70 year old tradition of lighting the Norwegian spruce in Trafalgar Square, given by the City of Oslo to the UK as token of gratitude, celebration and commemoration of Britain’s support during the Second World War. This gift shows the adaptability of Christmas Tree traditions, as, in this case, a traditionally decorated tree has itself become the gift and a symbol of deep and long-lasting friendships between nations. 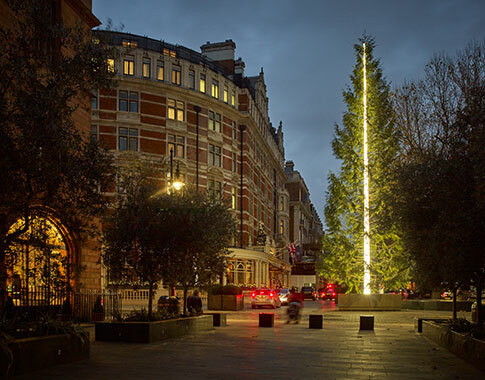 The tree commissioned by the Connaught Hotel in Mayfair is a new addition to the scene. Anthony Gormley’s 2016 tree is the second such commission, following the tree designed by Damien Hirst in 2015 with medical instruments for decorations. Gormley collaborated with lighting innovators Zumtobel on this project and the result is a blazing tower of white light reaching to the heavens which, at night, effectively renders its branches as redundant shadowy masses. Gormley could be said to have created a 17.5m lightsaber or light pillar; a brightly lit energy blade. Light pillars are a natural phenomenon, a vertical band of light created by the reflection of light from numerous tiny ice crystals suspended in the atmosphere or clouds. Such beams of light are often thought to herald events of great celestial or magical power. Like Jacob’s ladder or Jack’s beanstalk, this tree could be a connector between earth and heaven down which angels could climb with news for watching shepherds of rescue, relief or salvation or up which poor dreamers could climb to discover unimaginable wealth. Like Houshiary and Chinneck’s trees, the genesis of Gormley’s tree would seem to be a visual ‘what if’ to which meanings can accrue, rather than a specific conceptual play on the associations of particular Christmas Tree traditions. Whether your preference is for the traditional decorations and associations of the Trafalgar Tree or for the innovative visual images created by these commissioned trees, London affords this year a breadth of engagement with the sight of decorated evergreens and the gift-giving associated with them. The Connaught Christmas Tree 2016 by Anthony Gormley is located on Mount Street in Mayfair.